Tony Northrup is regularly asked by viewers how he is able to capture handheld shots at such slow shutter speeds. For example, it's not uncommon for him to shoot with a telephoto lens at shutter speeds as slow as 1/25 of a second. His shutter speeds are guided by the "rule of doubles," a rule he made up to replace the film-era reciprocal rule. With lenses and cameras featuring better image stabilization than ever before, he says the rule of doubles proves to work very well. Let's start first with the reciprocal rule. With your camera in a continuous shooting mode and set to auto ISO, you then use shutter priority mode and set your shutter speed to 1 over your focal length. For example, if you have a 70-200mm lens attached and set to 200mm, then the starting shutter speed would be 1/200 of a second. That's your "safety" shutter speed. The rule of doubles comes into play by doubling your exposure, so your shutter speed is now 1/100 of a second. You also double the amount of shots you capture, from one to two. Now let's do it again, double the exposure time to 1/50 of a second and capture four shots (or something like four, it doesn't need to be exact). And again, 1/25 of a second and eight shots. Keep doing this until you run out of time or patience. You have now taken a lot of shots and in Northrup's experience, if you quickly scroll through your shots at 100 percent on your camera, you'll be able to find keepers at shutter speeds you didn't think would allow for sharp shots. For example, in the video below, Northrup is able to capture a sharp shot at 1 second with his 70-200mm lens at 200mm. This resulted in a sharp shot at ISO 400 instead of the ISO 12,800 setting at a 1/200 of a second shutter speed. That's a substantial difference in image quality. 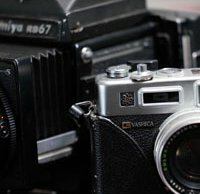 With all the incredible technology in cameras and lenses today and the ease with which you can capture a lot of shots, this technique is a great way to capture high-quality, sharp shots at lower ISOs than you might've otherwise even attempted. For example, if you have a cooperative and patient wildlife subject, why not give it a go after capturing shots at the "safe" shutter speed?